It’s officially the school ‘summer’ holidays. Rain, wind, dropping temps; yep it’s the British summer in full swing. I’ve slipped into my holiday mindset which is kind of like when you disengage the gears on a car in anticipation of a long period of no movement. So who doesn’t love sandwiches? I used to, a long time ago before I left bread-after-breakfast for dead. But I found this old recipe in my little book of mischief and thought I’d share it with you. You could definitely eat this salmon filling without bread, and rather pile it on a plate next to some sliced vegetables and use it as dip. The flavours are light, fresh and perfect for a satisfying lunch on a warm day. 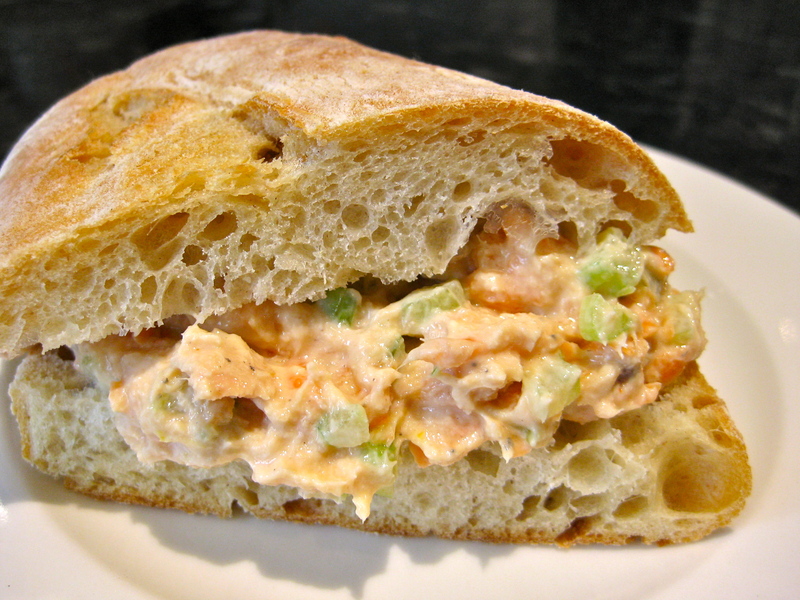 The combination of salmon, carrot and celery make it a nutritious choice for hungry kids who will never even guess what’s in this creamy and zesty filling. I’ve got my filling here pictured on ciabatta, but actually it’s much nicer as a wrap using a soft flour tortilla or lavosh bread. Mix everything together in a bowl and spread on to your favourite kind of bread. This recipe works very nicely with soft, flat breads like tortilla or lavosh.